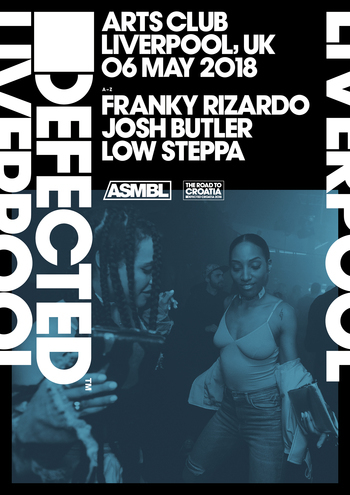 Continuing the Road To Croatia, Defected returns to Arts Club in Liverpool on Sunday 6 May for its first party in five years, bringing a Bank Holiday showdown featuring label residents Franky Rizardo, Josh Butler and Low Steppa on the decks. Franky will be delivering Defected anthems alongside label mate Josh Butler bringing a bass heavy sound that aims to get the party going. Low Steppa is also locked in to serve up some beats after completing his very first Defected Australia tour earlier this year. Arts Club is a multi-function venue known for hosting live music bands as well as some of the premier dance music events in the city inside the industrial-style Victorian venue. Situated in Liverpool’s Ropewalk, the club sits at the heart of one of the city’s most buzzing nightlife centres, well-known for its lively music and culture scene.